Sometimes if you have a bunch of people coming over, you want to serve eggs but not be chained to a stove making them. Especially over the holidays if you have a crowd at your house, it’s helpful to have a way to bake a whole bunch of eggs at once, and that is where this recipe comes in. Tucked in with ham, kept moist and flavourful with a little cream and cheese, these eggs are a great crowd pleaser. Serve them at home for a lazy Saturday or a light dinner, or whip up a whole bunch for a Christmas morning breakfast. Soft buns, fruit salad, and hashbrowns alongside round out the meal. I’ve been known to serve these with a tossed green salad, even. Whenever you eat them, breakfast is good any time of day, isn’t it? Grease either 6 cups in a muffin tin or six 8 oz ramekins. Line them with the deli ham. Crack an egg into each. Drizzle each egg with 1 tsp of cream. Sprinkle each with a bit of salt, fresh cracked pepper, and a little freshly grated Parmesan. 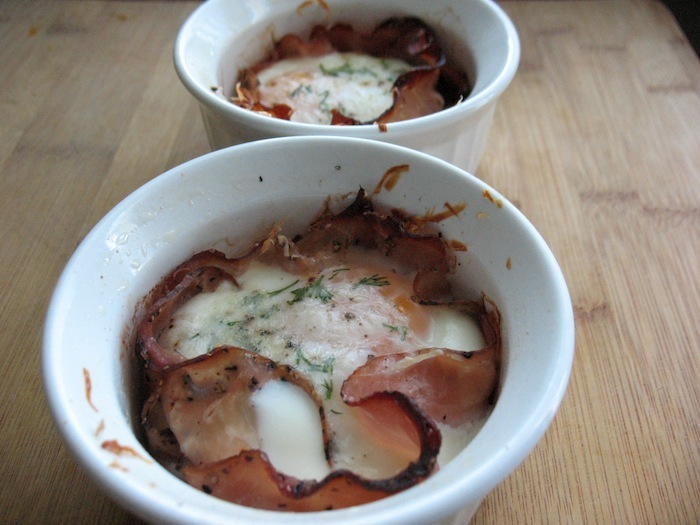 If using ramekins, set them on a rimmed baking sheet and place in the oven. Bake the eggs about 5-7 minutes, until bubbly and the white is firm. You can bake a little longer if you need to but be careful not to overbake. To cook just the tops turn the broiler on and, watching very carefully, cook them a bit until just set. Remove just before you think they are done, as the yolks will continue to set once you take them from the oven. Allow the egg cups to cool somewhat before slipping them out of the ramekins or muffin cups and onto a plate to serve.